What Will Uber’s IPO Bring to Yandex’s Table? Stepping up the race for automated deliveries with online retailers such as Amazon, Casino's Franprix chain will test the delivery robots on the streets of Paris's 13th arrondissement for a year. In the French capital, where Amazon has been running its Amazon Prime Now express delivery service since 2016, the speedy and convenient delivery of food has become a battleground among retailers. This is what builds the relationship with customers," Franprix Managing Director Jean-Pierre Mochet said of the service, which will be free. Amazon is shutting down its domestic e-commerce marketplace business in China. The U.S. firm said it will focus on "cross-border" selling to Chinese consumers. Amazon has faced stiff competition from Chinese e-commerce giants Alibaba and JD.com. Amazon will keep running its other businesses in China, including Amazon Web Services, Kindle e-books, and cross-border operations that help ship goods from Chinese merchants to customers abroad. Starting on July 18, customers logging in to Amazon’s Chinese web portal, Amazon.cn, will only see a selection of goods from its global store, rather than products from third-party sellers. Amazon said that it will close its online store in China that allows the country’s consumers to buy from Chinese merchants after facing difficulties competing with domestic champions Alibaba and JD.com. The company said it was shifting its focus to selling imported goods in China, based on greater customer demand for products from the US and elsewhere. “Over the past few years, we have been evolving our China online retail business to increasingly emphasise cross-border sales, and in return we’ve seen very strong response from Chinese customers,” the statement said. The outcome Wednesday was that it raised about $1.4 billion in an above-range initial public offering. 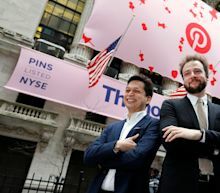 Pinterest operates in a crowded digital marketing space, where Google and Facebook Inc. get the lion’s share of ad dollars, and a smattering of smaller platforms like Twitter Inc. and Snap Inc. get the rest. The San Francisco-based company, which serves as a sort of digital bulletin board for pictures and ideas for furniture, fashion, weddings, recipes and more, has a direct line to millions of people who are looking for specific things to buy. The tech titan is reportedly looking for more ad-supported streaming media businesses. The planned projects — all along Dexter Avenue — join two under-construction office/life science developments totaling more than 1.1 million square feet. Facebook Inc is working to develop a voice assistant to rival the likes of Amazon.com Inc's Alexa, Apple Inc's Siri and Alphabet Inc's Google Assistant. "We are working to develop voice and AI assistant technologies that may work across our family of AR/VR products including Portal, Oculus and future products," a Facebook spokesperson told Reuters in an e-mailed response on Wednesday. According to research firm eMarketer, Amazon's Echo is expected to capture 63.3 percent of smart speaker users in 2019, while Google Home will account for 31 percent. Netflix Inc. (NFLX), the spectacularly successful streaming giant whose shares have risen about 7-fold in five years, is now overvalued and poised for a fall, according to Gene Munster, managing partner and co-founder at Loup Ventures. While many analysts remain bullish despite the streaming giant's mixed earnings report, Munster says the stock will be reined in by rising cash burn and heightened competition from rivals such as Walt Disney Co. (DIS), Apple Inc. (AAPL) and Amazon.com Inc. (AMZN), per an interview with CNBC. Netflix stock has fallen roughly 15% off its 2018 high and made little movement over the last three months. One county official told Amazon that he expected a bulk of the $75 million to be shared between two localities. Yahoo Finance's Adam Shapiro chats with Mercedes-Benz US.. CEO & President Dietmar Exler. He fills Julie Hyman in on the latest with luxury cars.